Spring. Beautiful one day, freezing the next. It's a very confusing time for all those little seedlings - not to mention the gardeners out in all weather. *if you're confident the last frosts have passed - and right now it's hard to tell. Whew! That ought to keep you going for a while. You can also plant herbs like basil, dill, fennel, tarragon and parsley now. We've had a few people ask about which tomatoes to plant. There's no right answer to that question. It depends on your own taste and also what you use them for: salads, pasta sauces, preserving or gobbling straight off the vine. Perhaps you want an all-rounder? Do you want to go for volume or taste? Prefer some different colours? This year Hungarian Heart and Jaune Flammé took the honours at the Diggers tasting in Adelaide. Last summer I decided to test out a few different heritage varieties, having always grown standard Roma and First Class for sauces and Sweet Bite for salads. 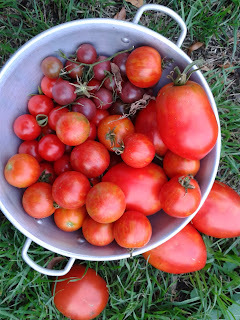 The surprise for me was Amish Paste - I grew it for making pasta sauce but its taste fresh from the garden was divine - and it bore kilos and kilos of fruit per plant. Tommy Toe is a prolific variety with small fruit about the size of an apricot that often win the Diggers taste tests and explode with flavour in the mouth. Black Cherry looks and tastes great, but in my test didn't bear as much fruit as expected. Tigerella not only looks great, with its orange and yellow stripes, but it bears well and the flavour is sensational too. The heritage varieties seem to win the flavour - and appearance - stakes every time. How about you? Have you got any favourite tomato varieties you can recommend? And any great tips for getting the most out of your spring and summer crops?